Since early this year (2014) I have been on a hunt for how Mirabilia (Nora Corbett) wants all the beautiful beadwork she designs to be attached to the fabric. Many websites, and even forums, give basic instructions for how to add beads, but none were satisfactorily "official" for how it should be done. My efforts were rewarded with a randomly scanned page from The World of Cross Stitching magazine, showing me exactly what I must do for Mirabilia patterns! The image was blurry, the instructions were short, but I preserved and will now share my knowledge with you. I consider this method the "official" way for Mirabilia styling since it was published in a magazine with her pattern. There are many other methods for attaching beads out there so don't limit yourself! Mattsma helped with quality control on this by making sure all my photos accurately told how to do it. So glad to see this viewpoint. Usually do free hand and not on cross stitching material, but would like to try this. Thank you so much! You're very welcome, I hope you have fun! Great tut with great pictures and very clear instructions, thanks very much for sharing it! Thank you so very much, you're quite welcome! Wow! It's a very cunning idea, thank you for sharing! Another trick to beading, use an actual beading needle, you can find them at most craft shops just look in the bead and jewelry section rather the needlework/sewing areas. They are about 2-3 inches long super thin and a bit bendy and will go though pretty much any bead from Mill Hill with two strands of floss. A buck or two will get you a pack of 4-5 needles. The hitch is that the eye of beading needles is also super fine so trying to cram two strands is tricky, I usually pull off a double length of one strand thread that though and pull about half the length through so I'm still using two strands to anchor my beads but the beading needle makes it MUCH easier. I'm not stranger to beading needles, as my gallery implies. I found any of my various supplies would do just that, fit the bead but not the thread, so I decided spending the extra second manually threading a bead was much less hassle than trying to thread a small needle! I like your idea, to just thread it once and let that become the end. The downside to this I think is that you have to cut the needle off it though, right? Not sure if the trade off is worth it for my techniques haha, I switch my threads pretty often and if I cut it off the needle it would sort of ruin the point of avoiding threading two thread through it. Love the tutorial, this will definatly come in handy eventually. Thanks!! I have needles that'll fit through the beads but not with eyes large enough to let me stick the DMC through the hole without a fit. I decided to just take the extra seconds to put on the beads manually instead of an hour of frustration threading the needle. Ohhhhhhhhhhhhhhhhh this is wonderful, I have beads on Cindy and this is just perfect, now I can't wait to try it, and I'm nowhere near that point. You're welcome and yayyyyyyy I can't wait to see! Isn't it? I was so pleased to learn it! Making cross-stitching patterns is something everyone can do! It can be as simplistic as taking some graph paper, drawing out what you want, and then stitching it on your fabric grid. 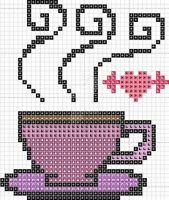 Or, cross-stitching can be done digitally, which is what I'm going to be showing you here today. It's worth noting that the stylization I am going to show you is of the "full cross stitches only" kind. This is different from my personal style of patterning, which is miles of backstitching and partial stitches and tiny beaded details. Why would you want to make a cross-stitch pattern? Perhaps you want your photo converted, and you don't want to pay someone else to do it, or maybe you need to do edits yourself to get the image you want. Whatever your reasons, know you have the ability to do it already.